These oven baked fries are the best – with potatoes, sweet potatoes or yams or mixing them all up together. 5 organic sweet potatoes, yams, red, yellow or white potatoes washed and dried. Peel if not organic. Slice them French Fry style. A rustic slice is fine, they don’t have to be uniform. If one is a little smaller than another, one will be crispier than the other, the diversity, as with all things in life — even with yams — works to your advantage. Toss them in a bowl with oil, if using and then mix in the herbs and spices. Place them on a lightly oiled cookie sheet. Spread them out so that they are not touching one another too closely. You may need more than one cookie sheet. Place them in a hot oven, about 400 degrees for about 35 minutes or until they look golden brown and no longer stick to the sheet pan. You can use this recipe with any kind of potatoes. I like using Yukon Gold because I find a waxier potato holds up better in the oven. 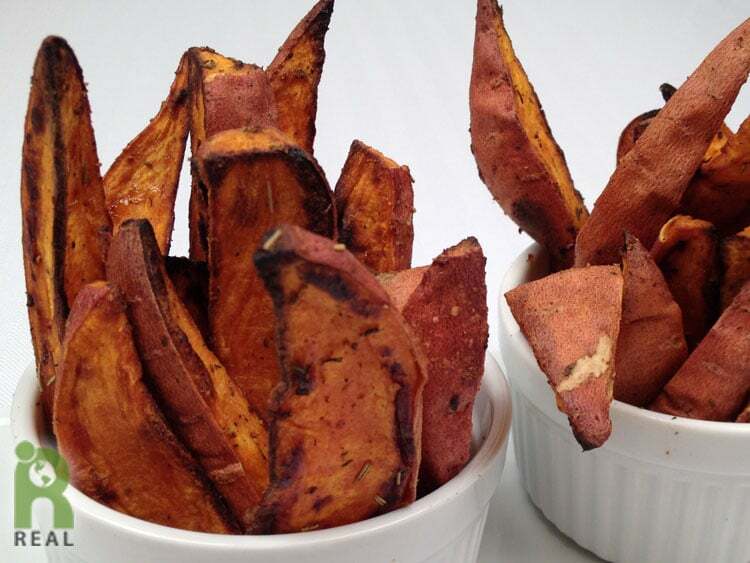 You can use red or white potatoes, sweet potatoes or yams. Try mixing different potatoes together. This recipe is a great way to have fries without all of the grease and hydrogenated oil you get with deep fried potatoes.